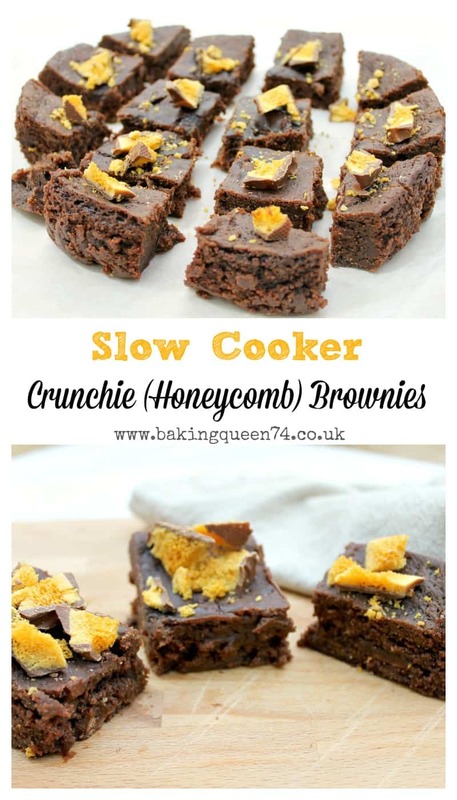 Brownies made in the slow cooker are so good, and these slow cooker Crunchie brownies are no exception! If you aren’t in the UK, a Crunchie bar is a bar of honeycomb coated in chocolate. If you are then I am sure you will know and love Crunchies as I do! Although I’m currently trying to eat more healthily, I think there is still room for the odd treat now and again. Besides, I’m going to share these with work colleagues and family, so I doubt I’ll get more than one piece! 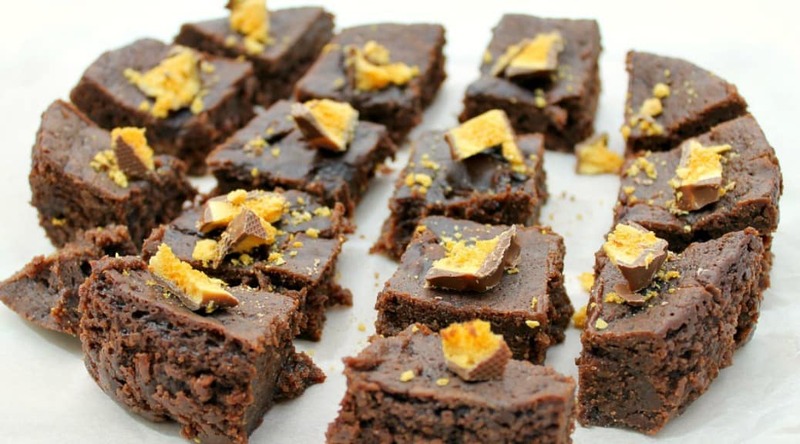 I put slices of Crunchie in the brownie mixture so they baked into the squares, then added extra on top, I mean you want to see them there don’t you. If you have disasters baking in the oven or just don’t have the time to keep an eye on the oven then you should try using the slow cooker to bake. I made these Crunchie brownies in a large (5.7 litre) slow cooker, in a large round silicone mould with water under it. As there is no direct contact, this means even less chance of burning. Please note though! If you are using a smaller slow cooker and cooking straight in the pot, do reduce the quantities for this recipe or it would probably be too deep and the brownies would take forever to cook in the middle; in that case you might need to look out to ensure the edges don’t burn. 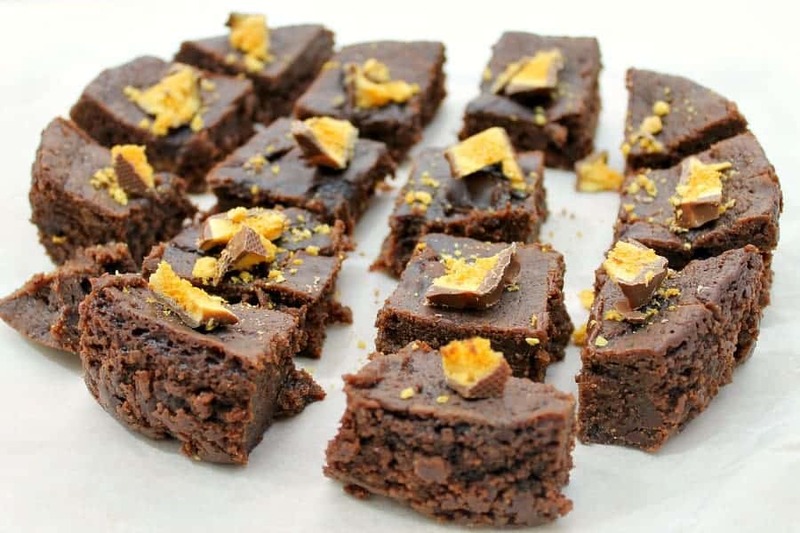 So rich, soft and fudgy with crisp edges and the crunch of the honeycomb on top, my slow cooker Crunchie brownies are perfect for an indulgent treat. 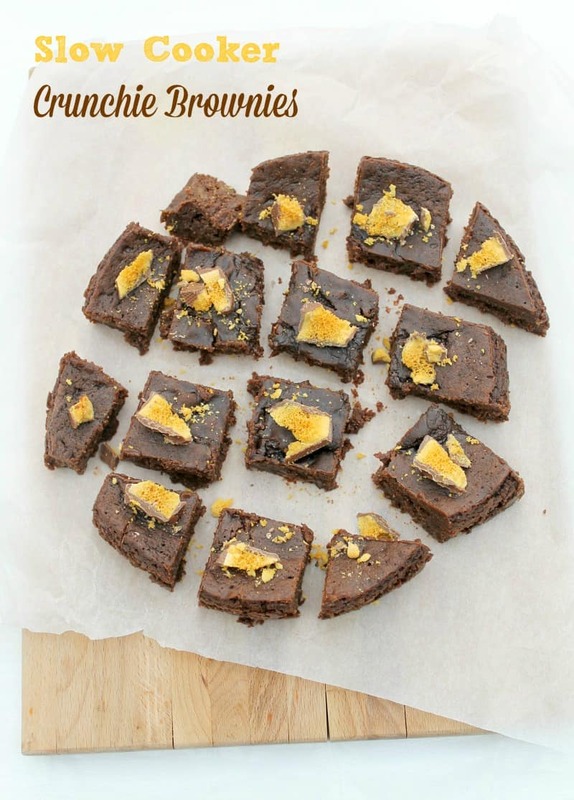 You get a subtle taste of honeycomb in the brownies too. Look how good they are, I could just dive in there now!! If you like these brownies, take a look at my other slow cooker brownies using the links at the bottom of the page. You’ll probably also want to take a look here for loads of recipes for baking and making puddings in a slow cooker. To make sure you don’t miss a post, make sure you subscribe here to receive posts by email. Cut the butter into small pieces and put it in a bowl. Break the chocolate up into pieces and add to the same bowl. Microwave for 1 minute on high or until melted. Stir until it is smooth. Allow to cool. Using a hand mixer, mix together the eggs and light brown sugar for 5 minutes at high speed, until thickened and frothy. Pour the chocolate/butter mixture over the egg mixture and fold in gently until mixed. Sift in the flour and again fold in gently until incorporated. Pour the brownie mixture into a greased silicone mould. I used a large round one similar to this. Chop up two of the Crunchie bars and put the pieces on top of the brownie mixture. Pour one large glass of water into the base of your slow cooker pot. Place the silicone mould in the pot, in the water. Place a clean tea towel under the lid of your slow cooker, place it on the slow cooker, and fold up the edges of the tea towel so they are over the lid. This stops drips from falling onto the brownies. Cook on high for approx 2 to 2.5 hours, until the brownies are cooked through apart from in the centre. I prefer them this way but you can always leave them in until completely set if you prefer. Remove the silicone mould from the slow cooker and allow to cool completely. If you can wait, then leave the mould in the fridge overnight and remove from the mould the next day - this will help the brownies to set and prevent them from breaking up when you take them out of the mould. 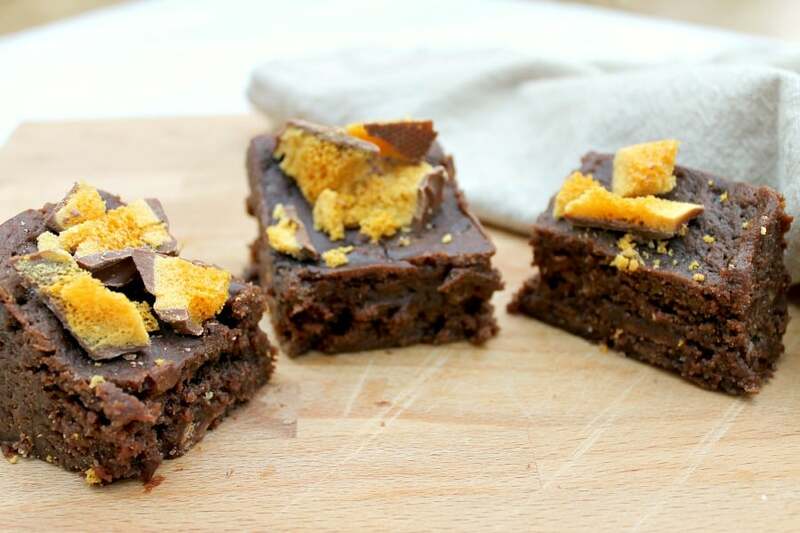 Cut into pieces, chop the last Crunchie bar and add pieces and crumbs on top. Yield 12-16 pieces. Linking up with Treat Petite with Cakeyboi (hosting this month) and The Baking Explorer. The theme this month is your favourite sweets, chocolate and biscuits – Crunchie is my favourite! Thanks for entering these into Treat Petite Lucy. I love crunchies and always get a Crunchie easter egg each year. I know I would love these! Perfect for you then Stuart, I will save you a piece when I make them next! I think it’s so clever that these can be made in a slow cooker! Crunchie is one of my favourites too! 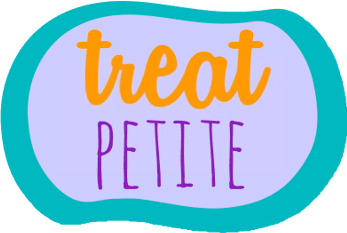 Thanks for entering into Treat Petite. Oh yum! I could do with some of these right now with my tea. Thanks Jemma, they were naughty but very nice! Thanks Sarah, I must try making my own honeycomb next time, will refer to your recipe! Gorgeous brownies, I mistook the name when I saw these thinking that the Brownies were actually crunchy LOL! Heehee, I do like crunchy edges on brownies but not the whole thing! Crunchie bars are the best! Putting them in a brownie is genius! Thanks Eileen, brownies are a favourite of ours! 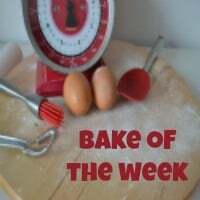 Thanks Emma, the idea came from this month’s Treat Petite challenge which was to bake with your favourite chocolate bar. When I get around to adding the logo to the post and adding it there that is! These seriously look so good omg! Honeycomb and chocolate are amazing. I think I need to make this!